Um, yeah, sort of. Except that capoeira–as it is usually practiced today–is a non-contact martial art. There are plenty of kicks and other take-down moves, but a skilled capoeirista usually demonstrates her superiority without actually hurting or even touching her opponent. When contestants “play the game”, it’s more of a dance than a fight. 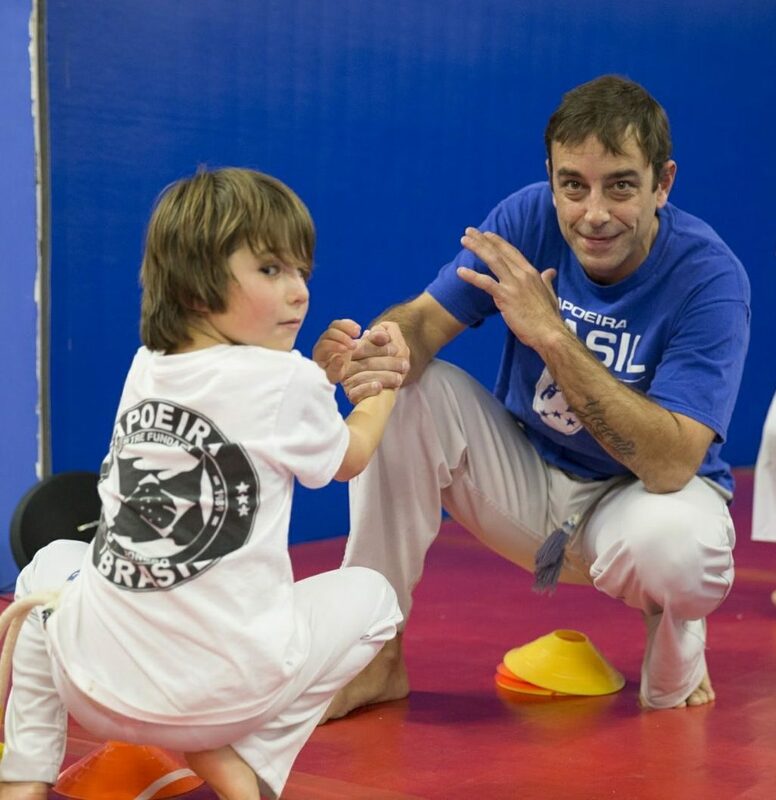 A year later, the twins continue to practice capoeira at Capoeira Brasil New England. This month they attended their first batizado, or baptism, earning yellow tips on their chord. Strength The kids work hard at capoeira practice and they have the muscles to show for it. They regularly do strengthening exercises such as bridges and planks, in addition to the impressive cartwheels, hand stands and fan kicks that they love to show off. Their balance has improved enormously (Twin V can stand on his head for over a minute) as has their flexibility. This gives them an incredible sense of accomplishment: they work hard and they can see the results! Rhythm While two contestants are playing the game, the others clap and chant and play the berimbau (a Brazilian percussion instrument). The contestants should be in time with the music and in time with each other. The kids are learning to listen to the music and keep the rhythm and move their bodies in time, much as they would in a dance class. Language Each class ends with a rousing practice of capoeira chants, which are in Portuguese. Typically, the mestre (master) sings the chants and the students repeat. But after a year, the twins can lead many of the chants themselves–which they do on occasion. One day V pointed out the similarity between Spanish and Portuguese, based on the words of one chant. Quero água para beber… So not only does he understand the Portuguese but he also recognizes and remembers the Spanish. Double score. Culture Besides all of these concrete and visible benefits, there is the added bonus of socializing with Brazilian friends and exposing the twins to a unique aspect of Brazilian heritage. It’s one small way to foster a curiosity about and appreciation of all foreign cultures.